Exercise books…worth the paper they are written on? It’s that magical time of year again…you scrimp and saved the budget all year and you’re ready for the big bulk order so you’re ready for the start of September (unless you saved carefully just for your budget to be frozen in March without word or warning…but that’s a story for another day) and what’s at the top of many lists?! Exercise books. Now don’t get me wrong, when I first had control of this as a HOD I was actually excited…what colour, what size, just lines or lines and plane!? But now…everything has changed. I lost my love with exercise books very shortly after that initial excitement (and not because all the good colours had been claimed by the other departments! )…it was the pointlessness of them to me. I am disorganised by nature. Thus to have any success I have to be double organised (if that’s a thing) so I have to plan many moons ahead. With exercise books I couldn’t do this as much as if I had everything photocopied way before a lesson. I hate pointless tasks. I see writing down an LO, date, title etc as wasted time. I get it can help create schemas in the brain and help memory but I would rather talk through an LO fully rather than spend most my lesson getting it down (my pupils strongly agree with this!). Lose sheets! How I hated lose sheets! When they hadn’t been stuck in, or stuck in wrong, or 5 pages in front/behind where they were meant to be (how?! seriously…how!?). So what did I do? I made my own! Everything printed in advance so I was ready lesson on lesson. There was to be no mad rush in the morning at a photocopy. No late last minute planning. No lose sheets! Everything there. Marking, starters, Extensions, Homework, G&T, LOs (differentiated), tasks (also differentiated)….just everything. Something non-specialists could use. For cover or for people in my department who didn’t teach the subject. Linked to PPTs. So once I had created them they just needed tweaking. On the front I added lesson by lesson criteria and marks. This allowed pupils to see where they were, what they were doing and mark their own progress. I have since dropped the pupil marking…it didn’t have the impact I wanted. I have also stopped calling it lesson 1 etc. Learning is in sections but not necessarily by the 1 hour slots I have (will have separate post on this soon). Pupils can then follow progress, reports are no longer a shock. I have since added homework (Prep. grades), starter marks and key word feedback. Its basically my mark book so goes home for parents to see. 2. Progress sheets. These are in the front and allow for different ways to show progress depending on the booklet. 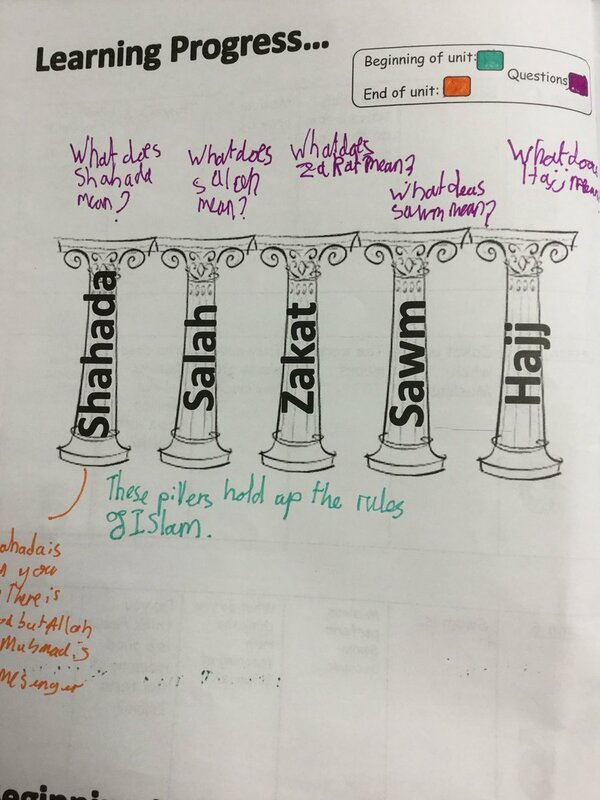 Some are questions at the start and they answer as they move through, some are images (5 pillars of Islam shown) and they add detail as they learn. Thus I have proof for every child of progress. If there is a question they ask that they don’t answer in lesson then this is set at the end of unit for home learning. For the pictures each learning session is linked to a picture that is shown with those pages. At the end of the lesson or end of unit they go back and answer the questions they ask (used as a plenary). 3. Starter pages. These are all on one page at the front of the booklet rather than with lessons. They often link 4 questions back to the last lesson and one question linked to the upcoming lesson or an open ended question. This allows me to, again, track progress and to see if they are any big gaps with pupils and intervene as needed. Also if they are getting full marks then I give Blobs (like house points) which keeps me focused on praise. They all know to go to these at the start of each lesson so great settling activity. 4. Key word progress. I have added these in for next year and haven’t used as yet. They will be given words and definitions at the start to spell and define. They will not have seen them. As we learn they will come back to these. If they had them right in the next test then they just copy (to reinforce) and they should add more each lesson as they learn. This can link into homework too. 5. Lesson themselves. They are all pre-planed with LOs (differentiated), activities (differentiated) and marking. Each has structure and key terms to aid the bottom. There is often “lined” sheets for those that do not need structure. Each links to a PPT that mimics or has other criteria. Higher level tasks are more about skill rather than being asked to write more. Tasks are done as white on black for dyslexic pupils. 6. Extensions at the back. All pupils know if they finish first this is where they go and any they do they get a point for the attempt and a point if they are correct. Again focusing on praise and means no dead time in the class waiting for the slower pupils. 7. G&T tasks. I wanted to push the top end so also included higher level reading at the back that allowed higher level skills that linked with the topic. This can be done at any time once class work or homework is completed and there is time left. 8. Help if needed when I am not about…or if they want to know more. This shows useful web pages that differentiate between BBC clips, simple text, more detailed text. 9. Homework. This was done and added as a menu. Each lesson they were directed to a section of choices that linked in. Meaning it is different for pupils of different skills and didn’t matter what lesson homework was set on. 10. Added extras. We are lucky enough to have Ipads but even phones can help this. I have now added in QR codes and pupils love it! It’s another thing they can look at if they want extra information and means I can link things I don’t have time for in lessons (I often add cross curricular links). Links to key thinkers and reflections are added in too to engage with the pupils. 11. Marking. I didn’t want to say the same thing again and again. I wanted it to be personal but quick. So I added comments into the book or common mistakes and added a place for small comments. 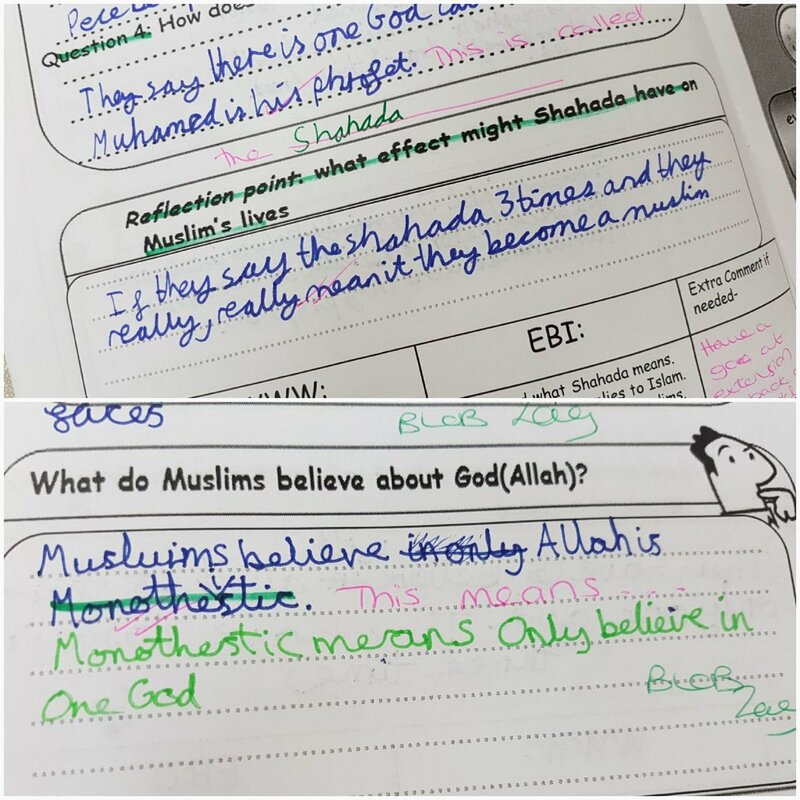 Pupils then reflect and change work in green pen. Another tick for progress. 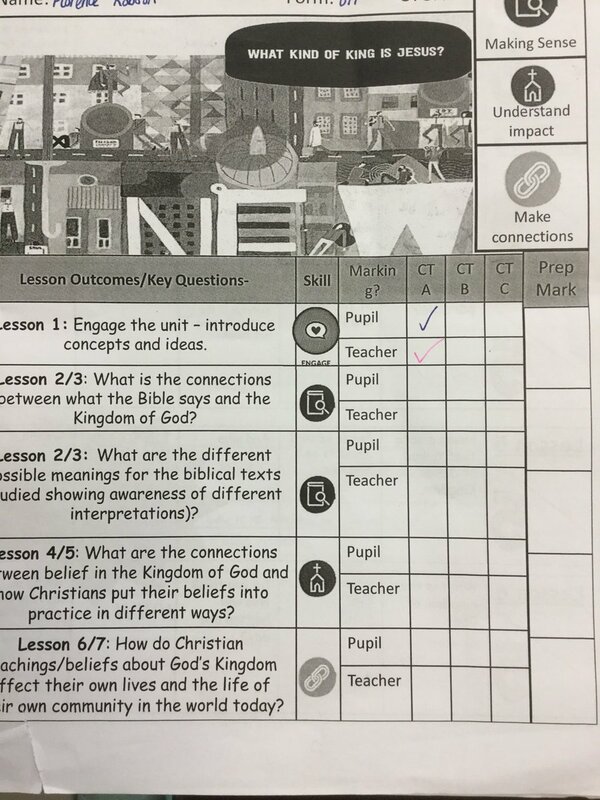 The boxes are at the bottom of every “lesson”. So what’s the outcome!? What are the worries people have?! Do they take a lot of time to make? They take time but so does planning. But guess what!? My planning for next year is done and by the summer my printing will be done up till Christmas. The initial effort is worth the pay off. Does it cost loads?! Its actually cheaper than doing things in double. I don’t pay for photocopying and exercise books. It is prescriptive? Everything can be…pupils have to fill the brief some how. I often give them options of tasks in the booklet and one is left black depending on level they are aiming for. As long as I plan for that it is fine. I also add blank and lined pages to avoid this and add options. Fab for cover. I was stuck abroad with a very ill family member and didn’t have to worry. I sent the PPTs off and the booklets did the job. Fab for non specialists. I am actually in the process of adding two page info sheets for them too…I have the time now. Fab for less organised. It’s all done as you walk in the lesson. Easily adapted next time. Make notes and change as needed. Always improving. Great for parents. They can easily see progress. I send the front cover and help sheets home so they can see what their child is learning and discuss it with them! It might not be for you but I love it! Sadly, in my classroom at least, the exercise book has seen it’s day. Plus it’s much easier to carry one set of these per unit that a full exercise book! My bad back has never been happier! Next postCtrl+C – Are we just copying the same mistakes in our reports? Hi, your booklets are amazing! Would you consider selling them on TES or privately? I would but some images and booklets are linked to a course I went on and some adapted lessons I have brought on TES so not sure where I stand there.